The building that later became Government Buildings was the last major public building completed under British rule. 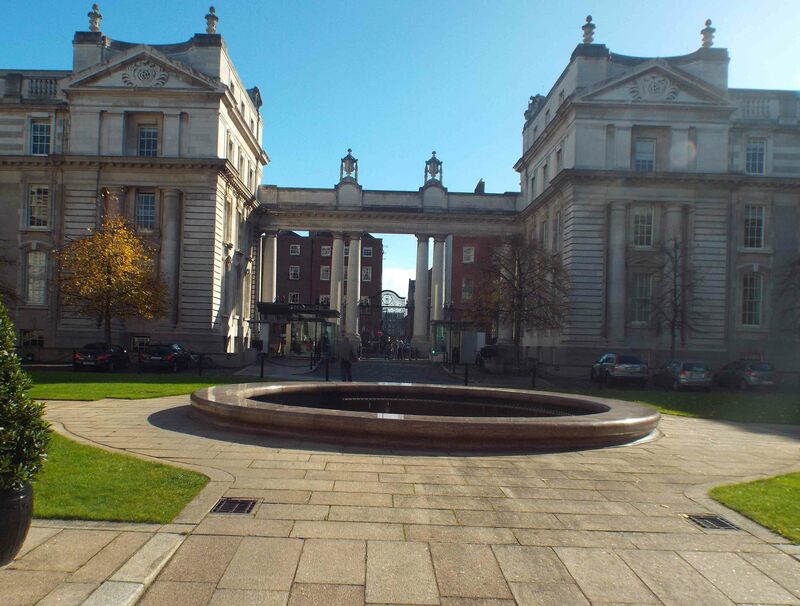 It was planned to create a block of prestigious cultural and educational buildings, similar to that of the scientific buildings in South Kensington, London, so the site on Upper Merrion Street was chosen. As such, eighteen four-storey Georgian houses were controversially acquired and demolished to make way for the new building. Edward VII laid the foundation stone in April 1904. The renowned architect Aston Webb (who redesigned the façade of Buckingham Palace) was appointed project architect. The Irish architect Thomas Manley Deane (who had recently completed work on the National Gallery of Ireland) was appointed as executant architect. His involvement was so important that George V knighted him, on the site, when he opened the first part of the complex in 1911. 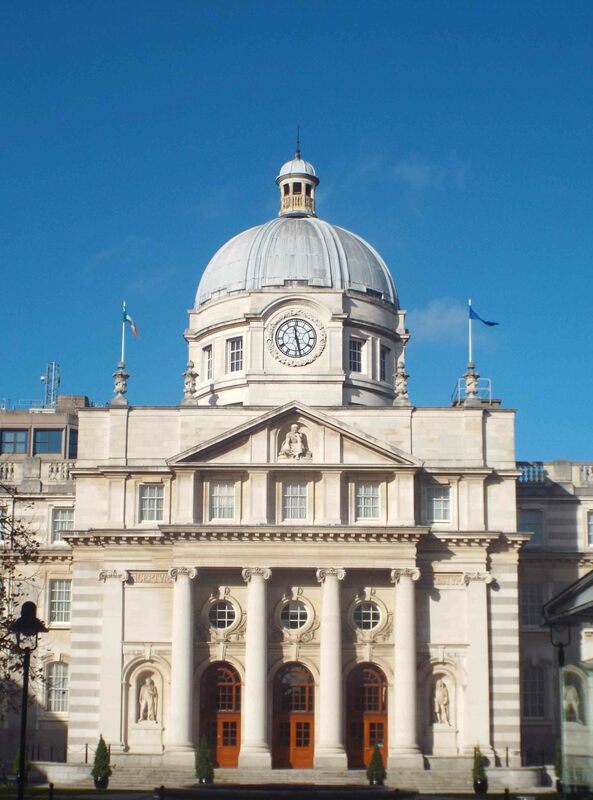 Portland Stone was chosen for the decorative facings of the building, with granite from the Ballyknocken quarries in County Wicklow used through the building. 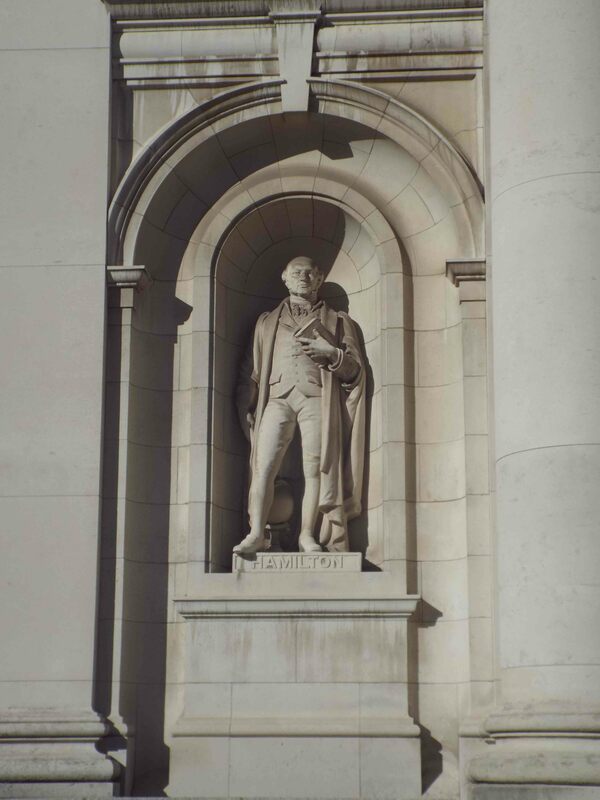 Standing on either side of the main entrance are statues of the Irish mathematician William Rowan Hamilton and the scientist Robert Boyle. Above them, a figure depicting science, designed by Oliver Sheppard and sculpted by Albert Power, is reputedly based on Auguste Rodin’s ‘Thinker’. The building complex was completed in March 1922, at a time of political unrest. When the new Irish Free State came into existence in December 1922, Leinster House (then the headquarters of the Royal Dublin Society – RDS) became the provisional seat of government. Soon the Executive Council of the Irish Free State along with other Government Departments moved into the recently completed north wing. By the mid-1980s Taoiseach Garret FitzGerald decided to convert the entire complex for government use. To finance the project a terrace of Georgian houses across the road was sold for £17 million. 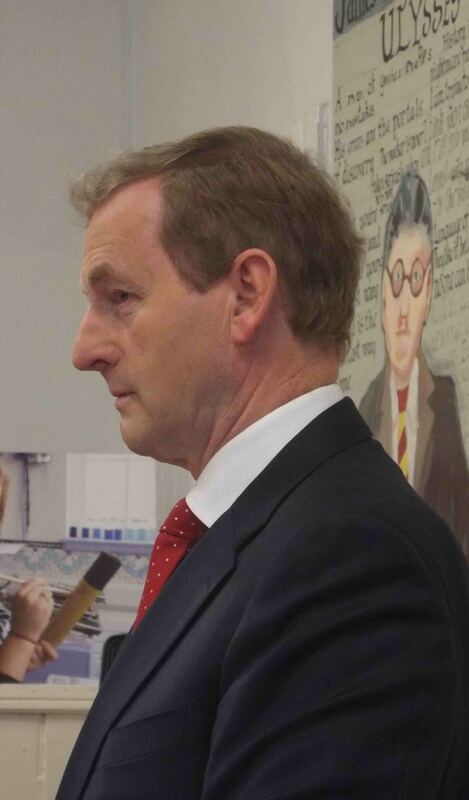 When the refurbishment was completed Taoiseach Charles Haughey moved into his new office in 1991. Although the work and expenditure was initially criticised it has since won many awards. The award of the Silver Medal by the Royal Institute of Architects in Ireland (RIAI) noted ‘the re-use of this existing building of acknowledged quality of this new, and entirely fitting, purpose, has created a special identity of Government, and has contributed considerably to Dublin’s status as an European capital’. 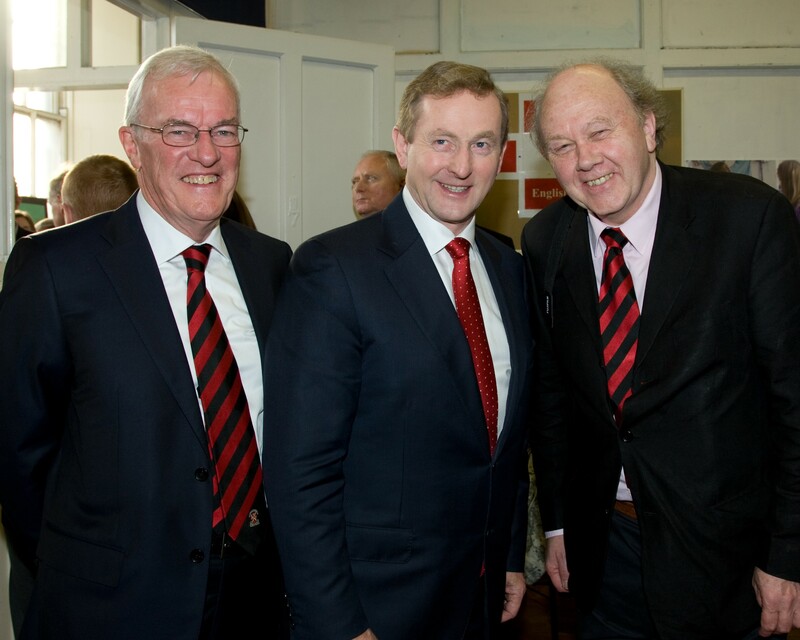 2014 is a big year for my old school as it is celebrating its sesquicentennial – 150 years – and the programme of events was started by, none other than, An Taoiseach, Enda Kenny. The school initially catered for pupils from the local, inner city, area but over time attracted many from the burgeoning suburbs due to its high academic achievements. And although the number of students is down on what it was at its peak in 1960s-1980s, it is now a co-educational school and also catering for a new ethnic mix – a symbol of Ireland’s current and future generations. On the day of his visit the Taoiseach viewed old registers showing the school’s most famous pupils, brothers Padraig and Willie Pearse. 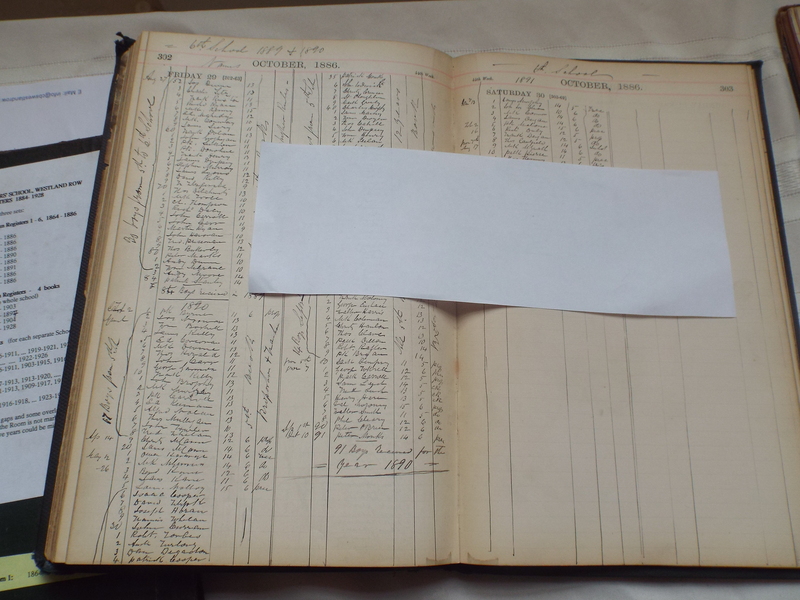 A number of other pupils, including Michael Malone who was killed in the fighting for Mount Street Bridge during the Easter Rising 1916, are also recorded. On the other side, many former students joined the army and fought against Germany during the Great War. One family, the Brennocks who lived close by, lost three of their sons in that sad conflict. The celebrations have begun well and we now look forward to the other interesting and enjoyable events to come. Check out the Past Pupils’ Union website for more details.